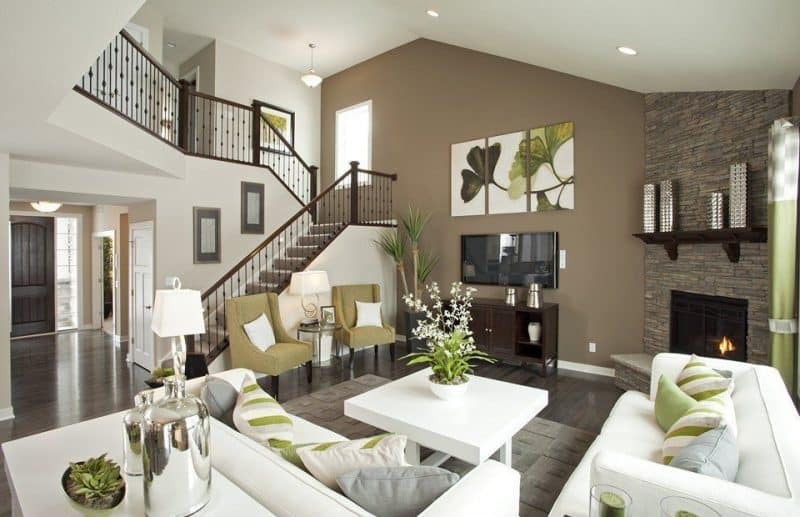 Bonjour and welcome to the Art of Home gallery of living room ideas with accent walls! These amazing pictures are here for your pleasure and consideration, we hope you’ll enjoy them as we tell you more about each one! Your living room is the gathering place for you and your loved ones. It is your haven where you can relax, watch TV, read, and enjoy spending time with your family. Depending on how you decorate this room, it also can be the ideal introduction to your personal sense of style as well as the layout of the rest of your home. When you want a living room in which you can take pride, you may want to create your signature welcoming atmosphere using the simplest yet most creative of living room ideas with accent walls. Indeed, a strategic accent wall can lend a combination of beauty and function in your living room that fits you. More than an artistic showpiece, your accent wall ties together the décor and announces your chosen look and feel of your living room. You can make this wall as impressive or understated as you wish so long as it coordinates with the other walls and the living room itself. As you view our gallery, you can take inspiration from these beautiful and unique living room ideas with accent walls. Sit back, relax, and take in all of the details as we give you some insight about each picture we offer to you now. Enjoy and beautiful day to you! The Little Plus: the limestone accent wall provides a beautiful combination of warmth and rustic elegance as it contrasts with the almond wood flooring and understated floor-to-ceiling ivory painted walls. The addition of a large mirror gently placed on top of the mantel adds a simple yet sophisticated touch to the entire space. 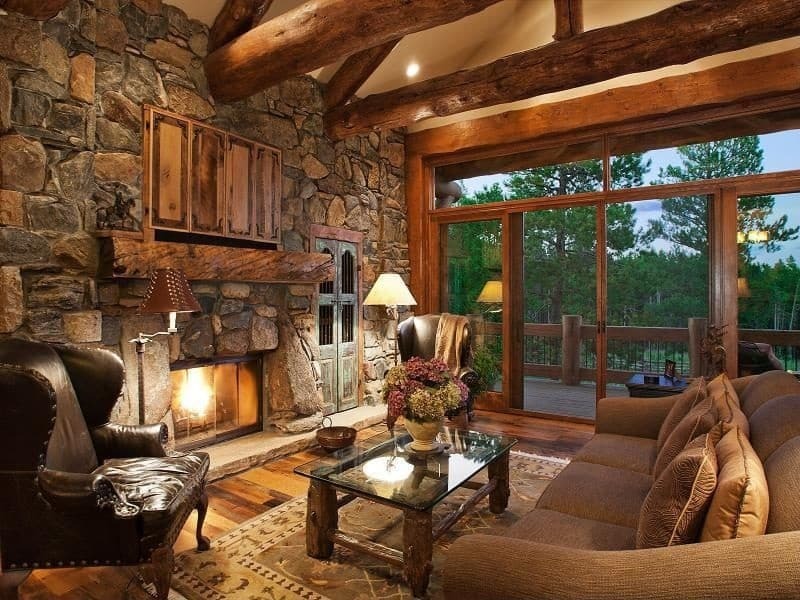 And how about this arch wall window — wow, just wow! The Little Plus: this painted mocha set up is one of the more simple living room ideas with accent walls — pick your wall, your favorite color and voilà! 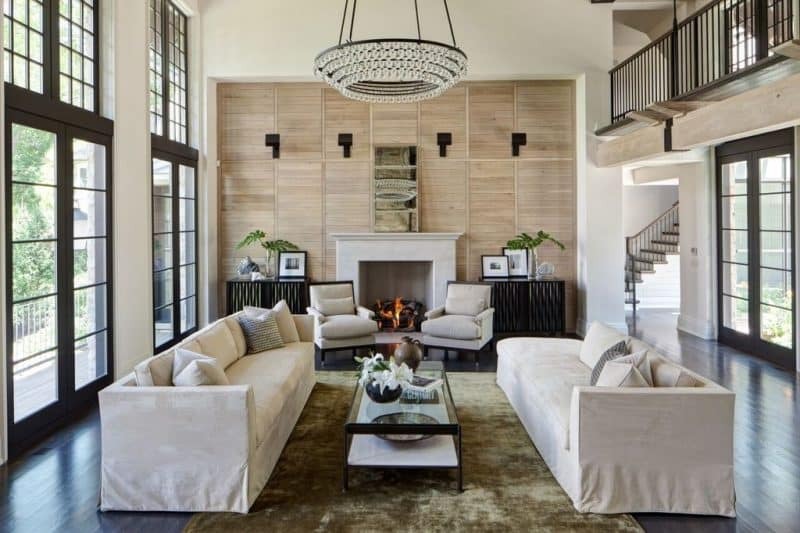 It provides a quiet yet upscale contrast to the unassuming white walls, oak banisters, and oak flooring. Choosing a color from the hues of the fireplace slate wall is a great idea — it flows and makes the room look larger. And notice the large green leaves painting — a nice calming companion to this muted mocha accent wall. The Little Plus: the casually comfortable Asian flare of this living room. 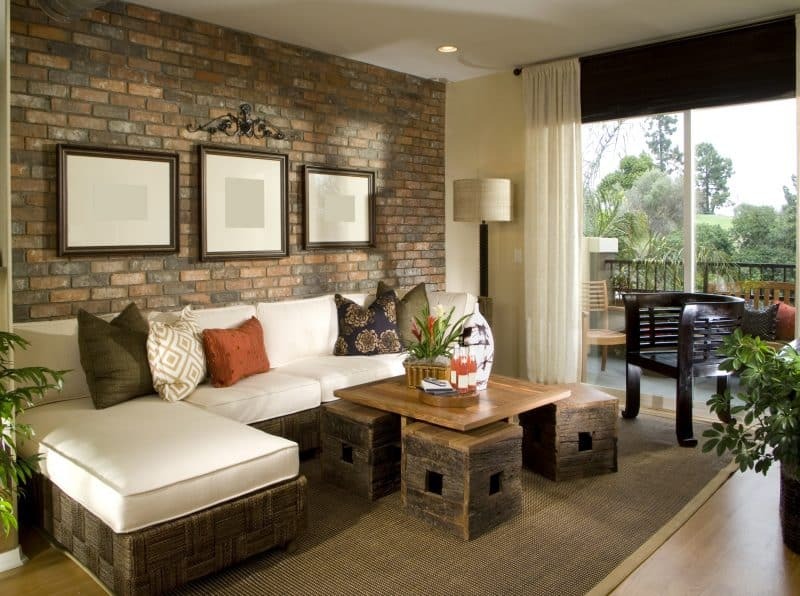 If you’re looking for versatile living room ideas with accent walls, exposed brick is a good choice. With its texture and one of a kind look, it brings dimension and intrigue to any living room. The Little Plus: this hand-made taupe paneling ties together the earthy tones and muted light in this elegant living room. It contrasts well with the herringbone parquet flooring and upholstered furniture. The variety of upholstered furniture, both in style and color, cleverly ties in the color palette of this living room, nicely done! The Little Plus: this light parquet wood accent wall lends a harmonious backdrop that both highlights the unique crystal chandelier and softens the bright sunny floor-to-ceiling windows. Also, having the sofa and chaise lounge face each other is a great idea to foster good conversation while relaxing. The Little Plus: this charcoal gray bookshelf offers practical storage for books and more as well as gives dimension and contrast to this neutral-toned living room. 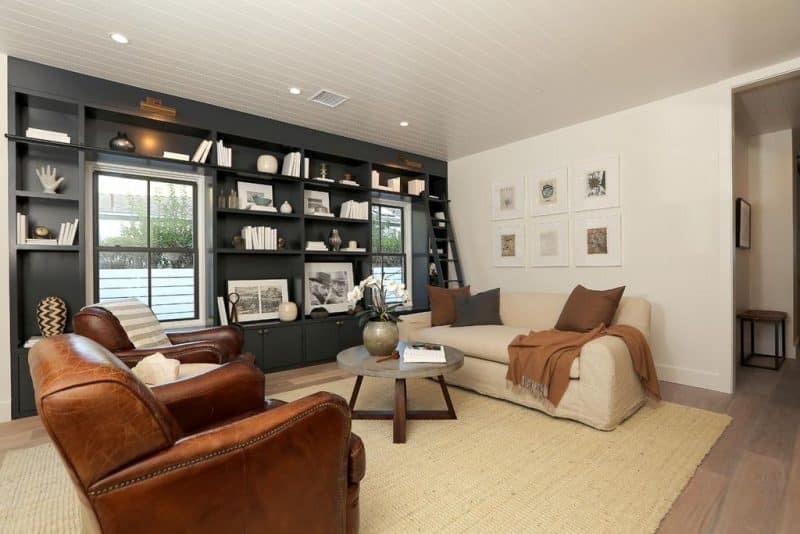 Also, notice the six small square matted frames above the sofa — a nice alternative to a large rectangular frame. The Little Plus: the ivory partitions that break up this eggshell accent wall serve as a focal point that complements the neutral-toned furniture and throw rugs as well as the matte finish wood floor. 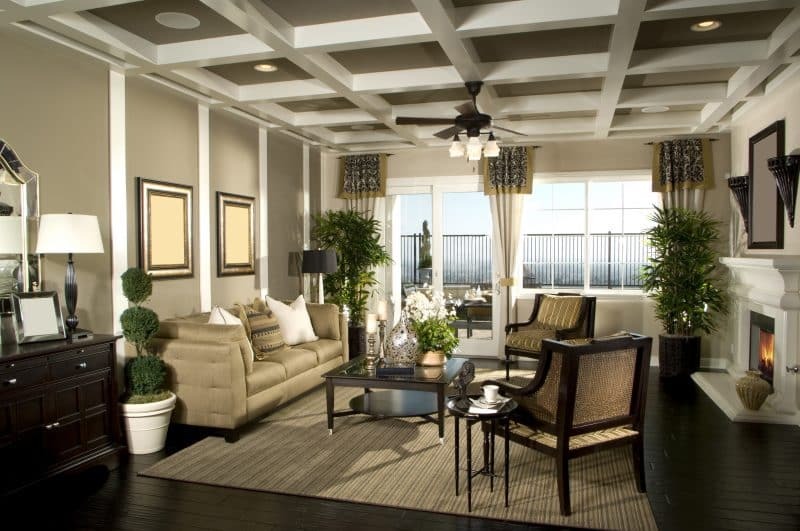 And how about the straight coffered ceiling with painted panels?